I was doing well for such a long time, posting most days, not sure what happened. Part is due to the non functioning app on my tablet, mainly because it's always at hand and easy to pick up and write something if only a little. The laptop is definitely easier and quicker to type on, but usually sits in the craft room and the chairs in there are not so comfy. Also have been busy. Saturday last was the garage sale at Erin's house, selling off all things unneeded or unused in preparation for moving next week. We had nice weather that day which was a blessing, but on the downside the city decided to resurface the road that morning and so we had to shut down before noon. She did sell most of what she had out though. After the packing up we took what was left to the Salvation Army to donate. We were both horrified at the incredible pile of "stuff" that they had in their storage area and felt bad at adding to it. Made us both decide to buy less and stick with used clothing whenever possible. She has already purchased an old clawfoot tub and matching sink at a vintage store and hopes to find more gently used items for her new home. When speaking with the contractor he gave her positive feedback on the tub and sink, saying that they would last much longer than the fiberglass tubs manufactured today. We all were tired on Sunday and mostly laid around though we did get the closet in my husband's office cleaned out. It's filled with toys and costumes, used to be the grandchildren's playroom. Now they have outgrown much that is there, so we will be donating those items to the local HeadStart program who at least can make good use of them. Yesterday I worked in the herb garden, trying to dig up most of the garlic chives that are threatening to overtake everything else in there. I left one clump because they do have a beautiful bloom. Got bit by a little black ant and my arm swelled up and is still red, hot and swollen. Already had poison ivy so think I'll lay off working out there for today. 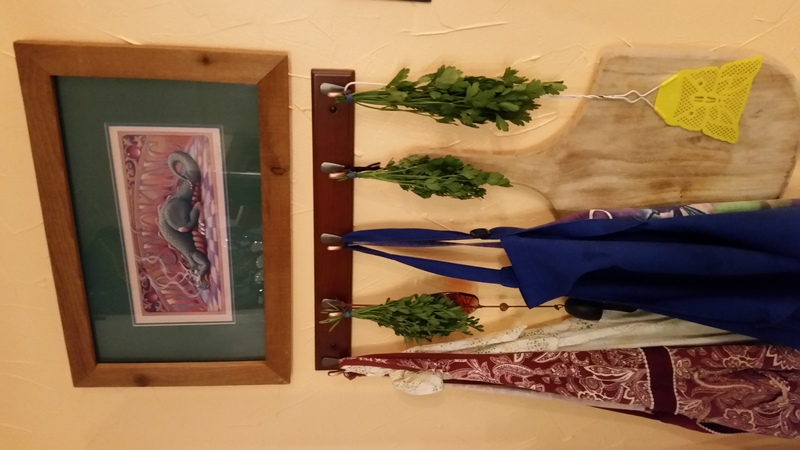 Did remember to cut the parsley and hung it up to dry. Finished the sci-fi book this morning and I was glad to be done with it, especially since one of the few characters to which I could relate was killed. Once again, time to begin a new book and unsure if I want to stick with sci-fi or go back to my regular reads. After composing this entry, I see another reason, I haven't written, not much going on except things relating to the kids moving in. My back has settled down again and that's a plus. Froze a couple of quarts of green beans and cleaned out the deep freeze, how exciting is that? And, I've turned the heel on the sock I'm knitting so it will be finished soon. I think it's time to go back to the word prompts and see if I can get some creative juices flowing again. Do you dry a lot of herbs? I often dry them and then forget to use them. Funny you should mention cleaning out the closet of kid stuff - my FB memory today was from 5 or 6 years ago, when I cleaned out a box of "precious" baby clothes. I couldn't remember why most of them were precious any more, so out they went. I'm almost looking forward to winter and knitting some socks or something again. I hve a pair that I have been working at for years. First I forgot how to turn the heel so it took a while until I found a friend who could help me Then I made them knee socks and couldn't get the cast-off loose enough to go over my wide calves. I have ripped them out several time to adjust. The last time, I was working on a nice stretchy cast-off and got sidetracked. It has been sitting, half finished, for several months. I'm with you on the used clothes - I like to buy things and then alter them to suit me. I have several dresses waiting for final adjustments (they are summer dresses so they may not get done until spring). Can you tell I like your "boring" posts? Enjoyed your comments and it seems I'm perhaps not as boring as I feel. Life on a small homestead is very simple and also repetitive, but maybe that's not boring at all. Could be that it's soothing and contented. You've given me something to think about. 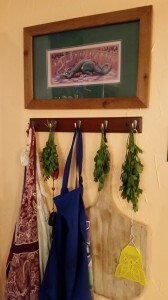 I dry herbs every year, use lots of parsley in this knock off ranch dressing I make and everyone loves it. I grow lots of basil and dry enough to last the year. I have also frozen it, but we don't eat as much Italian dishes as before because the tomatoes give daughter and husband heartburn. I don't usually do thyme or oregano, they and the mint stay green for a long time in a mild winter and they stuff with little leaves is a pain to work with. I've grown less industrious with time. The sock I am currently working on have been languishing in a drawer for a year, but at least I was on the second sock when I picked them up again. I usually do some charity knitting during the winter. Time will reveal if that's in the cards for me this year. Quite nice to talk to you about the simpler things in life. Have a great day.